Tech Siddhi is a technology focused site, bringing latest news and updates on gadets, softwares, hardwares in tech world to its readers. vivo recentlry announced a partnership with the top grossing mobile game - PLAYERUNKNOWN’S BATTLEGROUNDSMobile (PUBG MOBILE) by Tencent Games and PUBG Corporation as the title sponsor of the upcoming PUBG MOBILE Club Open 2019, one of the biggest mobile gaming tournaments in the world. 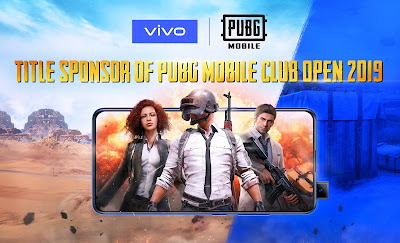 vivo will provide the official smartphones for the PUBG MOBILE Club Open 2019, which players from ten regions across the globe will be leveraging to battle their way through the Spring & Fall Split, for the total prize pool of $2.5M USD. This global partnership reinforces vivo’s commitment to bringing an ultra-smooth gaming experience to connect with consumers through meaningful partnerships. Sharing his thoughts on the partnership, Mr. Nipun Marya, Director-Brand Strategy, vivo India said, “vivo thrives to be at the forefront of the eSports industry to best serve its consumers. The partnership with PUBG MOBILE is a key milestone especially given that it is a leading mobile game developed by Tencent Games and PUBG Corporation that has millions of fans globally. PUBG MOBILE Club Open 2019 is a strong opportunity to showcase vivo’s vision of ‘enjoying the extraordinary’ by bringing global players a true gaming experience like no other. This global partnership will unfold and strengthen vivo’s position in being an innovative and stylish brand that always puts our consumer experience first”. “We are excited to partner with vivo, as they have a strong reputation in being innovative and putting the consumer’s needs first. As an innovative brand ourselves, this partnership highlights our dedication to bring the best experience possible to our players and fans around the world. This partnership is just the beginning, we want to continue building a strong portfolio of partnerships with industry-leading companies, such as vivo, to provide the best mobile gaming experience possible,” said Vincent Wang, General Manager of Global Publishing Department, Tencent Games. The PUBG MOBILE STAR CHALLENGE 2018 was watched by over 230 million viewers and drew in over 5,000 live attendees at the global finals in Dubai. The qualifying round of PUBG MOBILE Club Open 2019 will begin on March 22, 2019. The Spring Split Global Finals will be hosted in July this year, with the Fall Split Global Finals following in December. Tech Siddhi :- Tech as you know stands for technology and Siddhi in hindi means complete knowledge. Tech Siddhi is a technology site, focused on cyber and technical world's news, gadgets, software tips and tricks and lot more. The site shares all kind of topics relevent to subject and empowers you with complete knowledge of what's going on in tech world. Founded in 2012 Tech Siddhi is committed to provide you quality knowledge and information. We look forward to your support in this journey.